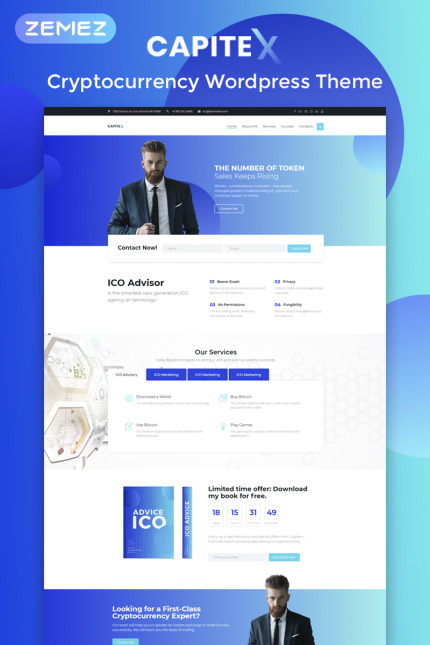 Promote your cryptocurrency business in the most modern way with Capitex ICO Marketing WordPress theme. You will be able to customize the site according to your needs thanks to a multifunctionality of the theme. It is equipped with a powerful Jet plugins bundle, which will expand your opportunities with Elementor Page builder. JetElements plugin will allow you to enrich the content with stylish and useful elements and apply different style settings to them. You will add attractive tabs and accordion blocks on the pages with the help of JetTabs plugin. It will be possible to jazz up your site with eye-catching animation and visual tricks using JetTricks plugin. JetWoobuilder will help to customize a professional e-commerce site in some clicks. A top-notch JetMenu plugin will let you build a mega menu with drop-down sections and design their appearance according to your taste. Capitex looks perfect on any device and has a convenient interface. Attract more visitors to your site with ICO Marketing theme!